If Woody Guthrie, America's most revered troubadour for social justice, was still alive he would no doubt be celebrating his 104th birthday today by writing songs about Donald Trump's attacks on immigrants, Muslims, the physically handicapped, and other groups and about the growing Black Lives Matter movement against police racism. Since Trump began his campaign for president, many comedians have parodied him, and many political pundits have winced at his outrageous comments, but no one has yet written a song that captures The Donald's full frontal craziness and mean-spiritedness. Guthrie, who is best known for "This Land is Your Land," would have had a field day finding things to write about Trump. In the 1940s, Guthrie penned a song, "Mr. Charlie Lindbergh," that that offers a glimpse into what he might have written about the presumptive Republican nominee for president. In the song, Guthrie excoriated two right-wing demagogues -- aviator Charles Lindbergh and the radio priest Father Charles Coughlin -- for views that sound very similar to those now expressed by Trump, who has branded his foreign policy with the slogan "America First." In the 1930s and early 1940s, Lindbergh and Coughlin were part of the "America First" movement, an isolationist, anti-Semitic crusade that wanted the United States to appease Adolf Hitler. Lindbergh served as the committee's principal spokesman and chief drawing card at its rallies. Hitler wrote to Lindy, said "Do your very worst." Gas on his stomach and Hitler on the brain. In fact, Guthrie did pen a song about Trump's father. In December 1950, Guthrie rented an apartment in Brooklyn owned by Fred C. Trump and soon wrote a song, "Old Man Trump," about his landlord's racism. The song -- discovered in the Woody Guthrie Center Archives in Oklahoma by Will Kaufman, a professor of American literature and culture at the University of Central Lancashire in England -- points out that Trump refused to rent to black tenants in his Beach Haven apartment complex near Coney Island. I just can't pay this rent! Trump -- who had been arrested in 1927 for participating in a Ku Klux Klan rally in Queens -- built the Beach Haven apartment complex using federal government subsidies intended to help returning World War 2 veterans find affordable housing. As Kaufman explained in an article for The Conversation, Trump was investigated by a U.S. Senate committee in 1954 for profiteering off of public contracts, including overcharging the government by $3.7 million for Beach Haven apartments. BY THE 1970s, the senior Trump had brought his son Donald into the family business, where the young Trump continued his father's racist practices. The U.S. Department of Justice charged the Trumps with violating civil rights laws for discriminating against African Americans in renting out apartments. Applicants by would-be tenants were coded by race. Doormen at Trump's buildings were told to discourage blacks from seeking apartments. The Justice Department and Trump Management reached a settlement agreement that did not require the Trump to admit guilt. 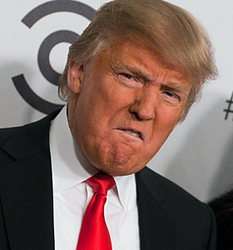 But Donald Trump's racist comments during this presidential season show that he's definitely his father's son. Guthrie's critique of Fred Trump's racism was no aberration. In his book, Woody Guthrie: American Radical, Kaufman traces Guthrie's evolving views on race relations, from embracing old-fashioned racist stereotypes from his Oklahoma upbringing to becoming a crusader for racial justice. In his song "The Ferguson Brothers Killing," Guthrie condemned the 1946 police killing of two unarmed black brothers, Charles and Alfonso Ferguson, in Freeport, Long Island after they were refused service in a bus terminal cafe. Guthrie was a prolific chronicler of many racist episodes and would certainly have been inspired to write about the police murders of Black Americans occurring today as well as Trump's attacks on Mexican immigrants. Guthrie penned the song in 1940 as an answer to Irving Berlin's popular "God Bless America," which he thought failed to recognize that it was the "people" to whom America belonged. In the song, Guthrie celebrates America's natural beauty and bounty but criticizes the country for its failure to share its riches. The lyrics reflect Guthrie's assumption that patriotism and support for the underdog were interconnected. Many Americans heard Guthrie's radical verses for the first time in January 2009 when Pete Seeger and Bruce Springsteen included them when they performed the song at a pre-inaugural concert in front of the Lincoln Memorial, with President-elect Obama in the audience. GUTHRIE WAS BORN in Okemah, Oklahoma in 1912. His parents named him for Woodrow Wilson, who would be the Democratic Party's successful presidential candidate that year. But as Woody grew older, his political views would become closer to those of Eugene V. Debs, the Socialist Party's presidential candidate, who got 16.4 percent of Oklahoma's vote in 1912, more than any other state except Nevada. Guthrie's father was a cowboy, land speculator, and local politician who did well during the oil boom, went bankrupt during the economic downturn, and struggled throughout the 1920s; the family often lived in shacks. Both his father and mother (who was eventually institutionalized for mental illness, later revealed to be Huntington's chorea) taught Woody Western songs, Indian songs, and Scottish folk tunes. In 1931 Guthrie moved to Pampa, Texas, and formed the Corn Cob Trio and then the Pampa Junior Chamber of Commerce Band, both singing cowboy songs. In 1935 he left for California looking for a way to support his young family. He hitchhiked and rode freight trains, earning money painting signs, playing guitar, and singing in the streets and saloons along the way. Guthrie had his first big break and taste of success while living in Los Angeles from 1937 to 1940. He landed a job on a local radio station, KFVD, singing cowboy songs, hillbilly tunes, religious hymns, and old-time ballads as well as his own compositions. He initially performed with his cousin Jack, but found a larger audience -- with two shows a day, six days a week -- when he joined forces with Maxine Crissman, known as "Lefty Lou". His audience -- including many Okies (from Oklahoma) and Texans living in makeshift shelters in migrant camps -- grew, and Guthrie began adding political and social commentary to his songs. His experiences in South California during the Depression inspired his radical views about social and political conditions. He wrote songs about families facing foreclosure by unscrupulous banks, migrant Mexican farm workers exploited by agribusiness, and politicians who turned a blind eye to the widespread suffering. He also penned patriotic songs about America's promise and its natural beauty, and angry songs encouraging Americans to organize unions and protest against injustice. While working at KFVD, Guthrie met Ed Robbin, an editor for People's World, the Communist Party's West Coast paper, and actor Will Geer, another left-wing activist, who introduced him to the local radical scene. Robbin helped Guthrie get bookings entertaining at local benefits (some at the homes of Hollywood stars) to raise money for striking workers and other left-wing causes. Geer traveled with Guthrie to support union organizing drives among cannery workers, cotton pickers, and construction workers throughout California. He also sang at the New Deal's government agricultural camps that provided a handful of migrant workers with food, safe water, and decent housing. Guthrie's songs of that period -- including "I Ain't Got No Home," "Goin' Down the Road Feelin' Bad," "Talking Dust Bowl Blues," "Hard Travelin'," and "Tom Joad" (based on the hero of John Steinbeck's novel, The Grapes of Wrath, about migrant workers) -- all reflect his growing anger and his mission to give a voice to the disenfranchised. In "Pretty Boy Floyd," Guthrie portrayed the outlaw as a Robin Hood character, contrasting him to the bankers and businessmen who exploit workers and foreclose on families' farms and homes: "Yes, as through this world I've wandered / I've seen lots of funny men / Some will rob you with a six-gun / And some with a fountain pen." In "Do Re Mi," he wrote about the Los Angeles Police Department's illegal blockade at the California border -- hundreds of miles outside its jurisdiction -- to stop Dust Bowl migrants from entering the state unless they had fifty dollars or could prove they already had a job. In 1939 Guthrie began writing a column, "Woody Sez," for People's World, commenting on the news of the day. The next year, the party's New York paper, the Daily Worker, picked up the column. Always restless, Guthrie moved to New York City in 1940 and was quickly embraced by radical organizations, artists, writers, musicians, and progressive intellectuals. He performed occasionally on radio and developed a loyal following. His admirers viewed him as an authentic proletarian, filled with homespun wisdom that energized his songs and columns. In the 1940s, Pete Seeger, Lee Hays, and Millard Lampell formed the Almanac Singers to perform songs about current events for unions, left-wing groups, and other causes. Guthrie sang on several Almanac singles and two albums, Deep Sea Chanties and Sod Buster Ballads, and often performed with the Almanacs, including at a huge rally in Detroit sponsored by the United Auto Workers union. Guthrie wrote some of the Almanac Singers' most popular songs, including "Union Maid." He had a gift for writing songs that told stories about current events and real people but were also timeless in terms of exploring issues of justice and fairness. In early 1941 the Almanacs performed songs opposing President Franklin D. Roosevelt's plans to enter World War II -- a view that Communists applauded but that alienated many of their admirers, including Eleanor Roosevelt. After Germany broke its truce with Russia and invaded the country in June of that year, the Almanacs changed their tune, writing patriotic songs that embraced the war effort and the US alliance with Russia to defeat Hitler. They were back in Mrs. Roosevelt's good graces. When their songs were in sync with the New Deal, the Almanacs were courted by commercial promoters. They sang on national network radio, made records, and performed at night clubs, including the upscale Rainbow Room at Rockefeller Center. Guthrie had several regular radio gigs of his own. But the Almanac Singers' political views -- including Guthrie's -- were too controversial to sustain mainstream success. After Seeger joined the army and Guthrie signed up for the merchant marine (he was later drafted into the army, serving until 1945), the Almanacs broke up. For a month in 1941 Guthrie was on the New Deal payroll, earning $266 to write songs for a documentary film about the Grand Coulee Dam, which brought electricity and jobs to Oregon and Washington. He moved to Portland, Oregon, and quickly wrote some of his most memorable songs, including "Roll on Columbia" (about the Columbia River), "Grand Coulee Dam," and "The Biggest Thing That Man Has Done." While in the merchant marine and the army, Guthrie composed hundreds of anti-Hitler, pro-WW2, and other songs to inspire the troops, including "All You Fascists Bound to Lose," "Talking Merchant Marine," and "The Sinking of the Reuben James." Guthrie painted the words "This Machine Kills Fascists" on his guitar. In 1943 he published his first novel, Bound for Glory, a semi-autobiographical account of his Dust Bowl years that contributed to his reputation as a rambling troubadour. By 1946 the Cold War-era Red Scare had made it harder for Guthrie to find work. Many of the Congress of Industrial Organization unions had purged their radicals and no longer welcomed Guthrie. AFTER MOVING OUT of Trump's Beach Haven apartments, Guthrie settled with his wife and children in a house in Coney Island, which inspired him to compose and record several albums for kids, including, Songs to Grow on for Mother and Child and Work Songs to Grow On. 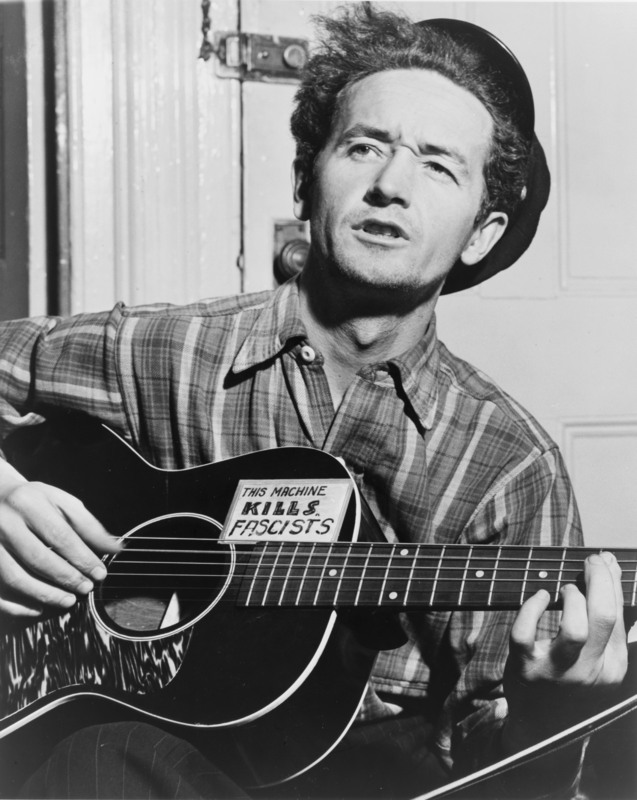 Several generations of parents have raised their kids with Guthrie's songs, many of which provided valuable lessons for living, including on such topics as friendship ("Don't You Push Me Down"), family ("Ship in the Sky"), neighborhoods ("Howdi Doo"), chores ("Pick It Up"), personal responsibility ("Cleano"), and family vacations ("Riding in My Car"). Guthrie was also connected with Brooklyn's Jewish community through his mother-in-law, the Yiddish poet Aliza Greenblatt, and wrote several songs with Jewish themes, including "Hanuka Dance," "The Many and The Few" and "Mermaid's Avenue." In the late 1940s Guthrie's behavior became increasingly erratic, even violent. These were symptoms of Huntington's chorea, a rare hereditary degenerative disease that gradually robbed him of his health and ability to function physically. Doctors at first mistakenly treated him for everything from alcoholism to schizophrenia. In 1954 he was admitted into the Greystone Psychiatric Hospital in New Jersey, where he was finally properly diagnosed. For the last decade of his life, he was confined to hospitals, barely able to communicate. Many family, friends, and young fans -- including Bob Dylan -- came to visit him to pay their respects. Although Guthrie helped inspire the folk music revival of the late 1950s and 1960s, he was unable to enjoy it or benefit from it financially. Since his death, Guthrie has become a cultural icon. Woody's friends Ramblin' Jack Elliott and Pete Seeger were his most effective promoters, ensuring that younger generations knew Guthrie's music. Many folksingers and rockers -- including his Dylan, Joan Baez, Phil Ochs, Tom Paxton, Arlo Guthrie, Jackson Browne, Bonnie Raitt, John McCutcheon, Bruce Springsteen, Ani DiFranco, the Klezmatics, and Tom Morello -- have followed in Guthrie's political footsteps, recorded and interpreted his songs, and joined forces with activist movements. At the request of Guthrie's daughter Nora, British singer Billy Bragg and the American band Wilco explored the many unpublished Guthrie songs in his archives and set them to music, producing two Grammy-nominated albums, Mermaid Avenue and Mermaid Avenue Vol. II. In 2012, the Los Angeles-based Grammy Museum and the Guthrie Foundation and Archives sponsored "Woody at 100," a series of concerts, conferences and museum exhibits around the country to celebrate the life and music of the radical troubadour and songwriter, including a tribute concert at the Kennedy Center in Washington, D.C. A diverse group of artists and performers turned more of Guthrie's unpublished songs, poems, and journals into songs and spoken word tributes in the album, Note Of Hope - A Celebration Of Woody Guthrie. As part of the centenary celebration, Smithsonian Folkways released a 3-CD box set, also called Woody at 100, that included some previously unreleased recordings discovered by the Smithsonian Folkways label. When Guthrie died in 1967, he was little-known by the general public, a cult figure among folkies and radicals. Today, his name and his songs are widely celebrated. Several of his songs (including "Bling Blang," "Riding in My Car," "Howdi Doo," "Mail Myself To You," "Happy Hanukah" and "This Land is Your Land") have been turned into children's books. His songs have been collected in a number of books and he is the subject of bio-pic film and several documentaries. Guthrie was posthumously inducted into the National Songwriters' Hall of Fame, the Nashville Songwriters' Hall of Fame, and the Rock and Roll Hall of Fame. In 2000 he was honored with the Grammy Lifetime Achievement Award. In 2012, the Los Angeles City Council named the intersection of Fifth and Main streets, not far from Skid Row, where he once lived, "Woody Guthrie Square." His "Roll On Columbia" is now Washington State's official song and "Oklahoma Hills" is the official song of his native state. Peter Dreier is professor of politics and chair of the Urban & Environmental Policy Department at Occidental College. His most recent book is The 100 Greatest Americans of the 20th Century: A Social Justice Hall of Fame, published by Nation Books.